L-1393 members rally in Harrisburg, Pa.
Home > L-1393 members rally in Harrisburg, Pa.
MEMBERS OF RAILROAD Local 1393 (Altoona, Pa.) rally for workers’ rights recently on the steps of the Pennsylvania capitol in Harrisburg. 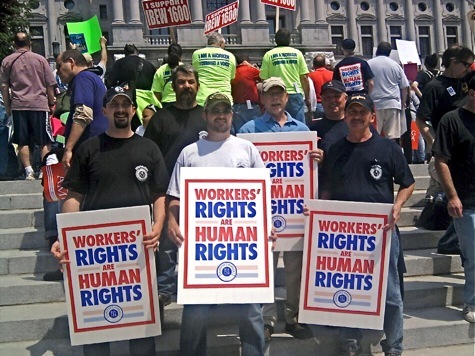 Across the country, union members are joining together to condemn Republican efforts to deny public workers collective bargaining rights and undermine labor unions. L. to r., Brian Chirdon, president; Bill Brubaker, chairman (Boilermakers); Bob Isenberg, vice president; Jerry Conrad, finance secretary; Tom Risbon, retired chairman (Blacksmiths); and Joe Chirdon, recording secretary.